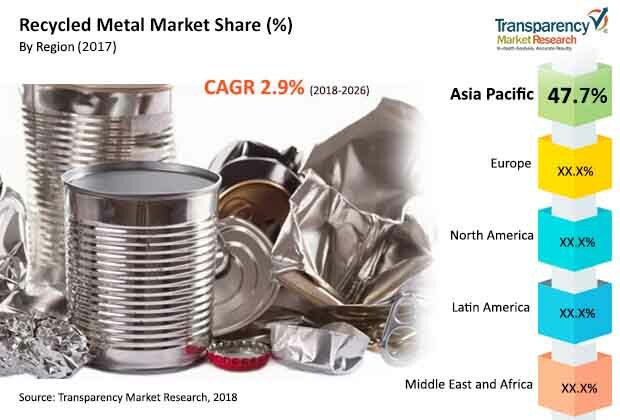 The recycled metal market was valued at US$ 713.44 Bn in 2017 is anticipated to expand at a CAGR of 3.5% during the forecast period, according to a new report published by Transparency Market Research (TMR) titled ‘Recycled Metal Market - Global Industry Analysis, Size, Share, Growth, Trends, and Forecast, 2018–2026’. Expansion in the recycled metal market is primarily driven by the increase in awareness about energy conservation through secondary production of metals, i.e. metal recycling. Manufacturers of metals have started adopting advanced energy management systems to lower their environmental footprint. A large amount of energy is required for the extraction of metal from ores. Energy consumed in metal production accounts for approximately 8.3% of the global energy consumption. Furthermore, the extraction process leads to the emission of greenhouse gases. The primary production of metals entails extraction of metals from metal ores, while secondary production involves the preparation of metals from scrap collection. Primary production of ferrous metals entails the reduction of iron oxide to iron by reducing agents such as coke, coal, and natural gas. The reduction takes place at a high temperature and entails high energy. However, the electric arc furnace (EAF) process is used in the secondary production of steel from scrap. The process consumes considerably less amount of energy. Thus, the energy requirement for primary production of ferrous metals is significantly higher than that for secondary production. Therefore, secondary production of ferrous metals through recycled metal leads to cost reduction. Production of 100 kilo tons of aluminum from bauxite ore requires 4,700 terra joules of energy. Production of other non-ferrous metals such as copper, lead, nickel, tin, and zinc also entails significant amount of energy. Furthermore, the extraction process results in the emission of greenhouse gases. However, non-ferrous metals can be produced from scrap metal sources through a cost-effective method that consumes significantly low amount of energy. The emission of carbon dioxide is reduced during the secondary production of non-ferrous metals. Manufacturers of metals have started adopting advanced energy management systems to lower their environmental footprint. Recycled metal is projected to help industry players achieve their sustainability goals in the near future. This, in turn, is estimated to propel the recycled metal market in the next few years. Generation of e-waste has increased significantly over the last few years. Constant innovation in the electronics industry has resulted in digital revolution. Changing demands of consumers and constant improvement in technology are driving the electrical and electronic goods market. As a result, electronic goods with conventional technology are being replaced with new devices with improved technology. This, in turn, is driving the production of waste from discarded electronic and electrical equipment. A well-designed and effective recycling system can encourage the reuse of electronic waste. Electronic waste management systems help prevent the loss of precious metals and lower the emission of greenhouse gases. Led by the rise in awareness about environmental concerns, governments of developed and developing countries are focusing on recycling of electronic waste to encourage resource conservation. The rate of metal recycling from e-waste is anticipated to increase substantially in the next few years in order to meet the rise in demand for metals in several end-user industries. Thus, e-waste is expected to be the most promising source of recycled metal, considering the significant increase in e-waste generation and rise in demand for metal. Demand for various ferrous, non-ferrous, and precious metals in construction, automotive, and electronic industries is likely to increase significantly in the near future. Thus, recycled metal is estimated to be a lucrative end-user of the global e-waste market during the forecast period. In terms of revenue and volume, Asia Pacific constituted significant share of the recycled metal market in 2017. Expansion in automotive and building & construction (especially new construction) industries is estimated to provide lucrative opportunities to the market during the forecast period. Asia Pacific is anticipated to be a highly attractive region of the global market, with growth potential being exhibited by China, India, and ASEAN countries such as Indonesia, Malaysia, and Singapore. Japan South Korea, Australia, and New Zealand are some the mature countries of the recycled metal market in Asia Pacific. Europe followed Asia Pacific in terms of revenue and volume in 2017. This trend is anticipated to continue during the forecast period. The overall recycling rates in EU-28 countries for various metals are high compared to that in Rest of Europe. Domestic and imported scrap is utilized in Europe, which contributes to the market share held by the region. The U.S. accounts for significant share of the market in North America. Metal recycling is an established market in the region. Automotive, shipbuilding, and industrial machinery end-users constitute large share of the demand for recycled metal. North America is also one of the leading producers of recycled metal. Players of different sizes and shares operate in the global recycled metal market. High intensity of competition is likely to exist among established players due to their integrated value chain. Exit barriers are high owing to the high fixed costs and large capital investment made at the initial stage. This, in turn, intensifies rivalry among market players.